Where light weight of a cross country shock meets the maximum control of a downhill bike. 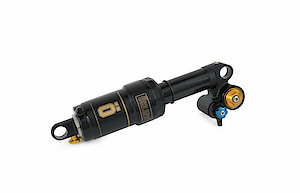 The Öhlins STX 22 Air offers unheard of traction and support in light weight durable unit. 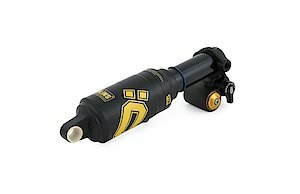 The STX 22 Air features a large piston diameter balanced by a large compression valve that ensures internal pressures are kept under control. This results in low hysteresis and excellent damping response, offering ride efficiency without tampering with downhill control. Low and high speed compression and rebound damping are externally adjustable with an additional climb mode setting, a stability mode facilitating long climbs with maintained traction. The new rider tune air spring features a seal system optimized for low friction but also to give a smooth balancing of pressure between the air chambers. The result is initial suppleness supported by mid-stroke control and that extra bottom out resistance coming from air spring characteristics. It is also possible for the rider to tune the spring for a more progressive or a linear feel.